On Sunday I drove out to Foster City to photograph Pooja and Akash's engagement ceremony. A friend had recommended me to this lovely couple and I was more than willing to be a part of this very special occasion for them. Unlike Sacramento, the Bay Area is much cooler and shooting outside is pretty good almost any time of the day. I brought my trusty Sony cameras, drove down Interstate 80 and got right to work when I met up with them. Akash wanted to do some shots with his fiancee prior to the formal ceremony so we went out of the event center to a gorgeous waterfront area. There were many scenic backdrops to get awesome photos such as an amphitheatre, a boardwalk overlooking the water, and some beautiful trees. We stopped at the amphitheatre to get a few ring shots. Here I'm using my super wide 15mm Tamron lens to get a lot of the background into the photo. Pooja's fist looks super big, but I think it's a unique looking effect. 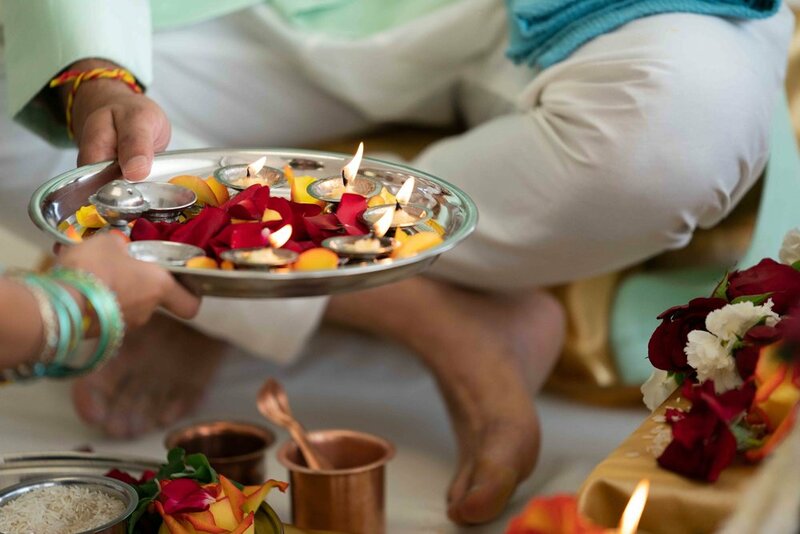 One of my favorite aspects of Indian ceremonies are the colors. Everyone is dressed very colorfully, and today was no exception. Akash and Pooja were in a blue and green motif that lent itself well to the serene blues of the sky and water at the location of our shoot. Because it was a very bright day, the camera had some trouble getting all the colors correct so I did have to use the power of Adobe Lightroom to get back some of the saturation I wanted. Shooting the ceremony was a bit of a difficult task as Akash and Pooja were backlit due to a huge window behind them. Shooting in .raw format helped cut back on the extreme highlights and pull up shadows to get a photo that has good exposure. I think the background here is still a bit too overexposed, but it works. I also had to take A LOT of yellow out of the image as the indoor lighting cast a huge yellow hue to everything. These ceremonies have many intricate details to them and I wanted to capture everything I could. Thankfully, my 70-200mm 2.8 lens gave me the reach I needed to get up close shots. Pooja and Akash were up on a stage that I couldn't access so using this telephoto zoom lens were key in getting up close and personal. During this shoot I used the holy trinity of zoom ranges - from ultra wide 15mm all the way to 200mm. This shot here is one of my favorites from the day as I like to find shots that have natural frames to them. Here Akash had his hand on his head as part of one of the rituals. It gave a nice window to take a photo of Pooja's smiling face through it. I really had to rely on perfect autofocus for this shot - thankfully the Sony a9 is more than up to the task in getting photos like this. I brought along a variety of lighting and flash devices, but ended up only using them for a few shots on the day. I made the decision to go mostly natural light because I think it came out better than the ones with the flashes. It's important to use professional judgement for the event so that all the photos have a similar look to them. You really just have to go with one or the other. It was an extreme pleasure to work with Pooja and Akash. I hope they had the opportunity to enjoy their ceremony today. If you're looking for wedding or engagement photography, please contact me now! Dates go fast!